Rugby World Cup is currently held in New Zealand and the best thing is, All Blacks team (NZ team) are in the finals !!!! I hope they can bring back the World Cup and make New Zealand proud. Somehow makes me feel proud as well because, erm, I'm in a country where they win World Cup? Haha. 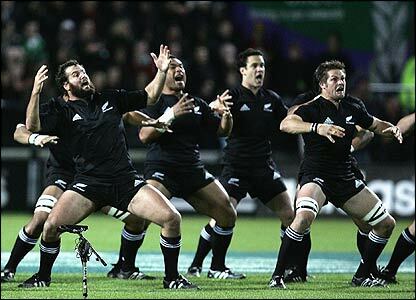 I think their haka is pretty cool. The other day my friend was quite surprised that I watched Rugby. I'm surprised on the other hand, that he is actually a fan of All Blacks as well. He said their Haka is cool. Haka is a traditional Maori war dance from New Zealand. They often do it before the start of the game. Here's a video of the All Blacks doing the Haka with English translation. Winners of the inaugural Rugby World Cup, New Zealand are the leading points scorers of all time and the only international rugby team with a winning record against every test nation they have ever played. The All Blacks have held the top ranking in the world for longer than all other countries combined and in over 100 years only five of the top twenty ranked test rugby nations have ever beaten New Zealand. Even so, NZ only won World Cup once in 1987. I really hope they could win these year and bring back the World Cup after 24 years. The final games is on this Sunday! I just finished watching the Australia Vs Wales games. So Australia won the 3rd place and Wales came up to 4th. I'm so excited for Rugby finals! Yeah I know, I'm just done with my first exam paper today :D I'm gonna watch Rugby even though I'm having finals!